Ames and I are looking forward to this weekend’s match-up of Steve Spurrier’s Gamecocks and Urban Meyer’s Gators this weekend here in Columbia. The tension has been building, tickets are hard to come by, and we have several friends from Gainesville coming up for this momentous occasion. No matter what the outcome, it will be one heck of game to be at. This is the kind of excitement that makes college football so fun to watch…unless you come from my Alma Mater. The University of Central Florida is an amazing school with great classes, a beautiful campus, and a unique atmosphere. In 1968, UCF (formerly Florida Technilogial University) began classes with an enrollment of 1,948 students. Today, the school boasts over 40,000 students, and competes with most major universities in all but one arena – school spirit. For the 4 years I attended UCF, I loved going to the athletic events and cheering on the Knights…but having to drive about 20 miles to and from the Citrus Bowl for football games really takes away from the “hometeam advantage”. In the last couple years, the University has been (Finally!) working on incorporating an on campus stadium to it’s master plan. 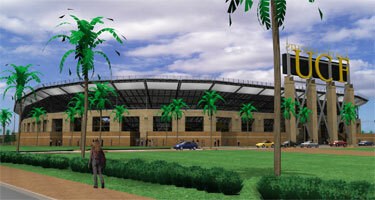 I’ve enjoyed reading about the stadium plans in Pegasus (UCF’s Alumni Magazine) and online at http://stadium.ucf.edu/. Seeing renderings of the proposed stadium, like the one above, have really fueled my enthusiasm for the project and I’d really like to go to a few games once it’s built. Sounds great, right? Well, not to the contemptuous coalition behind the so-called UCF Community Watch. In following the progress of the stadium plans, a friend and fellow UCF alum came across their site and sent me the link a few months ago. The information propaganda on this site is a biased, demeaning (to the actual “UCF Community”), and downright desperate attempt to derail the plans for any on-campus stadium. I’ve attempted in the past to share my opinion’s through the blog comments, only to see them deleted, or that they’ve disabled comments on posts that have enough intelligent information to bother writing a counter argument to. I’ve since reserved my opinions on the topic to conversations with friends and fellow alums, but after seeing the images in this post, and this one, I can no longer contain my opinions. The residents living around the UCF campus are reaping the financial rewards of having one of the best Universities in the state in their backyard, yet they don’t want that university to succeed. Although the football team is doing much better this year, they went 0 for 11 last year. That’s right, they didn’t win a single game! I want to see my Alma Mater excel, not just academically, but in sports as well. I’d like to see UCF win a conference title, go to bowl games, and give the big teams a run for their money. They can’t do this without fan support, and I know from the games I attended at the Swamp that being at home in a packed house sure helps intimidate opponents and spur on the home team to victory. So with that said, I fully support the university’s plan for an on-campus stadium and proudly say Go Knights! Update: After a final public meeting on November 9th the UCF Board of Trustees Approve Construction of On-Campus Stadium pending final approval of financing. By amending the campus master plan to include the stadium, construction could begin within the next few months and be completed before the 2007 football season. That site is really funny. I especially like all the comment spam. I attended UCF for 1.5 years in the Digital Media Program and I can not agree more about the lack of school spirit. UCF students are in their own little world and even the sports like Basketball which is played at the UCF Arena on campus get poor attendance at times. 2003-04 Season they actually sent out letters asking students to attend the games because the basketball team is doing well and they have no support. I think Football is the pillar of all the college sports, When the stadium is up and running I think it will revive school spirit on UCF’s campus. I’d like to see these UCF Community Watch try to stop them. Like you said, UCF has been in the area over 40 years and has supported the community around it. It’s not going to get shut down by a few biast bloggers that like to spread propaghanda.